Don't be fooled by his squatty, rotund build and gap-toothed smile! The Prankster is one of the most vicious and cunning super criminals in existence! His modus operandi is taking practical jokes and pranks to deadly extremes. As outlandish as it may seem, The Prankster is one of Superman's oldest and most persistent archfoes. He has worked alongside Lex Luthor, Mr. Mxyzptlk, and The Toyman. It seems as if his ultimate goal is to mock society, and make fools of others. He has played untold practical jokes on the citizens of Metropolis, and never knows when to quit. While The Prankster is eventually captured by The Man of Steel, he continues to come back for more menacing mirth and mischief. One of his grandest plots involved the ownership of the alphabet. By obtaining the copyright, he would charge people for using letters, and forcing society to pay him while going about its days. Another legendary scheme is to continually making a mockery out of Superman. 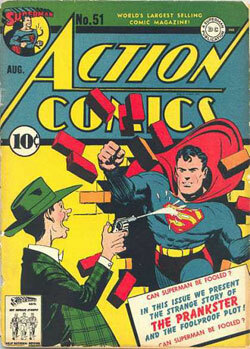 It is said that he - of all the villains - actually made Superman knock himself out! When it comes to The Prankster, always expect the unexpected, and stay on your toes!